Bulgarians decorate themselves every year on 1st March, a holiday of “Grannie Marta” (Baba Marta) with martenitsa (red and white symbol) - a small piece of adornment, made of white and red yarn. It is worn from today until the appearance of the first blooming tree or the first stork. This tradition makes the date one of the most Bulgarian customs ever. The white color is a sign of beauty, symbolizes purity, innocence and joy. The red one is the color of vitality, health and love, victory, life and courage, the light of a rising or setting sun. This color according to popular belief, has the power of the sun and gives vitality to every creature. In the end of March you can see many trees adorned with red and white bracelets in Bulgaria. 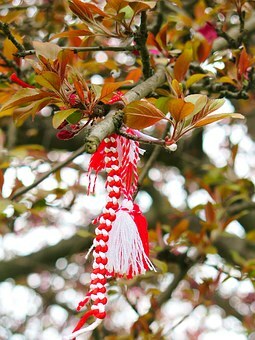 The tradition is that when a person who wears martenitsa sees a blooming tree to tie it on its branches. Greek ethnologists connect this custom with ancient pagan history of the Balkan Peninsula, especially with the agricultural fertility cults. Martenitsas (μάρτης) in Greece are preserved only in the high mountain areas far from major urban and cultural centers. Usually in small villages in Greece grandmothers tie martenitsas to small children’s hands to be healthy and happy all year long. 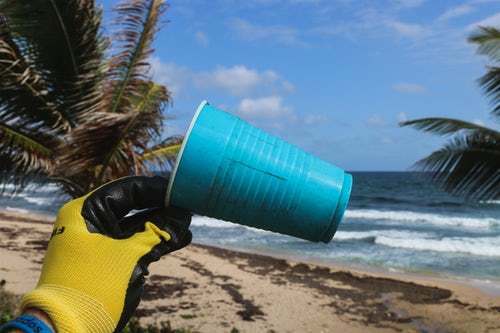 In general, this custom is forgotten in the big cities, but around the Universities and the places where young people gather, you can see smiling boys and girls with red and white bracelets around their wrists. Martenitsa (mărțișor) is an ancient symbol of an ancient scenario for the revival of nature on the cusp of spring. This ancient custom, according to tradition, is related to the time of symbolic death and symbolic birth of a local female deity – Baba Dokiya. Martsashor is also the name of March in Romanian language.